If your kids are anything like mine, by the morning of November first they will have some seriously stomach ache producing quantities of Halloween candy. Between church, school parties, extra curricular activities, Fall Festivals and let’s not forget trick or treating, we’ll have pounds and piles of candy at our house. There is NO WAY they could or should eat it all, so we’ve got some ideas for what to do with all that leftover Halloween candy. In the US, it’s estimated a child consumes between 3500-7000 calories in candy alone on October 31st! While it’s fun to indulge in all the sugary fun at the holidays, there is a point where you almost feel like you’re drowning in all the treats. Plus, let’s be real, they aren’t the only ones eating it. So, not sure what to do with leftover Halloween candy? Here are some fun options that you might not have heard about or considered. Candy can be sent to US soldiers, you can find a list of accepted items here, along with information about where to send the packages. There is also good information about additional items if you’re interested in contributing to care packages for the military. There is a list of additional donation opportunities below as well! The holidays are right around the corner and there are tons of yummy cookie, cake and bar recipes that call for candy in the ingredients. Have the kiddos separate the different varieties and you’ll have a start on the next round of treats! Many dentists will buy the candy from children and then donate it. If you check here, it will tell you the names and information of dentists in your area that participate in this program. Kira uses this approach with her kiddos. For 3 days, it’s an all the candy they can eat policy. Then the Halloween Fairy arrives and swaps out all the remaining candy for a toy of their choosing that costs under $20. She keeps some of the candy for school lunches and desserts at home, and then yes and truly, she tosses out the rest. Otherwise, she would be eating it all. The more choices the merrier when it comes to creating these holiday houses! Round up a few friends and invite them over to sort through the stash and create gingerbread houses with your family! Another idea would be to partner up with a few parents in your child’s class and organize a gingerbread house making extravaganza instead of regular holiday party! Local shelters for women and children especially appreciate candy donations around the holidays, as well as home baked goodies. A group of friends and I packaged up several little bags of candy that were placed on each child’s pillow Christmas Eve. All those brightly covered wrappers make for some fun sorting & patterning activities! 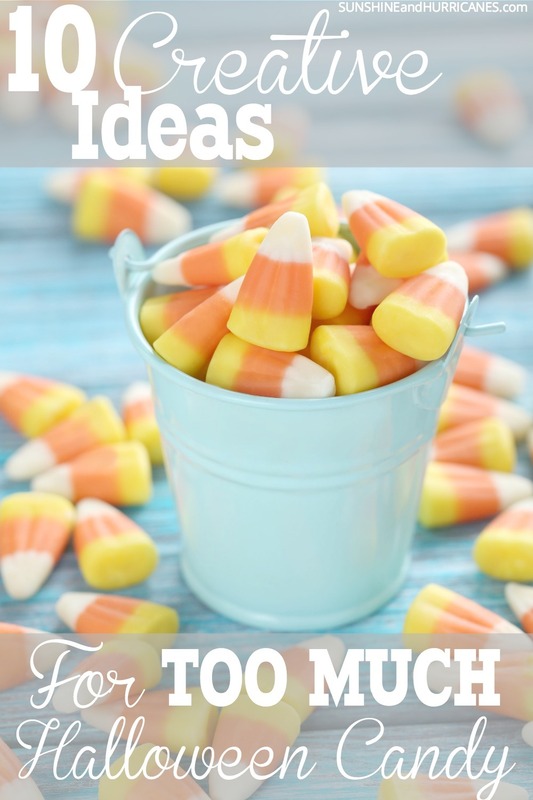 There are some great ideas right here about extending learning and some science explorations via all those Halloween treats! You can create some pretty amazing things with candy wrappers: jewelry, purses, bowls and much more! There are great ideas right here and many of them would make fun holiday gifts as well! Make little bags or packages with thank you tags and leave them for the mail carrier, UPS driver or trash collector. Deliver to the fire or police station, set out in baskets in the waiting rooms at the hospital or the staff lunchroom. Brainstorm with your kids about people who often go without even a thank you that help your family and community, such a simple but meaningful lesson! Local children’s homes, food pantries, soup kitchens, addiction treatment centers(often those struggling with drug or alcohol abuse use candy to help themselves through withdrawal), Operation Christmas Child, Ronald McDonald House, and local retirement centers. It is estimated that over 250,000 pounds of candy is donated each year vs. the 600 million pounds purchased! Do you have any other creative ideas for what to do with leftover Halloween Candy? Holly, that is a FABULOUS idea!!!! It’s pure genius on SO many fronts, thanks for sharing! I think I am going to make a gingerbread house with mine. Thanks for the suggestion. Our school accepts donations the week after Halloween for the troops. This year they collected over 1200 lbs.! I still can’t believe it. I should have saved some for gingerbread houses in hindsight, though I am doubtful it would have lasted in our house until December. : ) Great ideas! Great ideas! Now I wish we hadn’t eaten most of ours already! 😉 Thanks for linking up at the Thoughtful Spot Weekly Blog Hop! We hope you stop by again next week! Thanks, Samantha! Appreciate the link up! Great ideas, Michelle! I especially love the idea of donating it or using it for random acts of kindness. Thank you so much for sharing at Think and Make Thursday! Thanks for hosting, Carrie! Appreciate the link up! I’ve already put aside the candy to donate. TY! Thanks for hosting the link up! I love the gift bag idea! Really thoughtful. I can’t believe how many great ideas there are that I never even realized! Thanks for sharing these – I think we’ll save some for gingerbread houses and donate or trade-in the rest! I totally steal my kids candy too, I can’t believe they aren’t on to me by now. My favorites are 100 Grand bars and Almond Joys. We have used the candy fairy in the past. This year, our kids are a little older and we are asking for semi-voluntary donations to soldiers. There is just WAAAAY too much candy!!! Visiting from the Family Fun Friday link up! Would love for you to stop by my blog and enter my current giveaway (great organizing materials)! Thank you so much for attending week 8 of #PureBlogLove and linking your fantastic blog post, I can’t wait to see what you have in store for our party next week Thursday 8 PM EST- Sundays at midnight. Your post has been added to the #PureBlogLove Pinterest board for all to see 🙂 Have a great day! 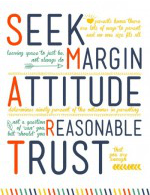 Super awesome blog post! Just wanted to invite you to recipe and DIY craft Link party Thursdays-Sundays for our celebration! I’m excited to see what you’ll bring. Feel free to submit 3 of your your own creations that are recipes or crafts. These are all great ideas. I especially like the Halloween Fairy idea. This is a great list and much of this, I didn’t even know existed! I love the ideas of random acts of kindness or using them for games. Love it! 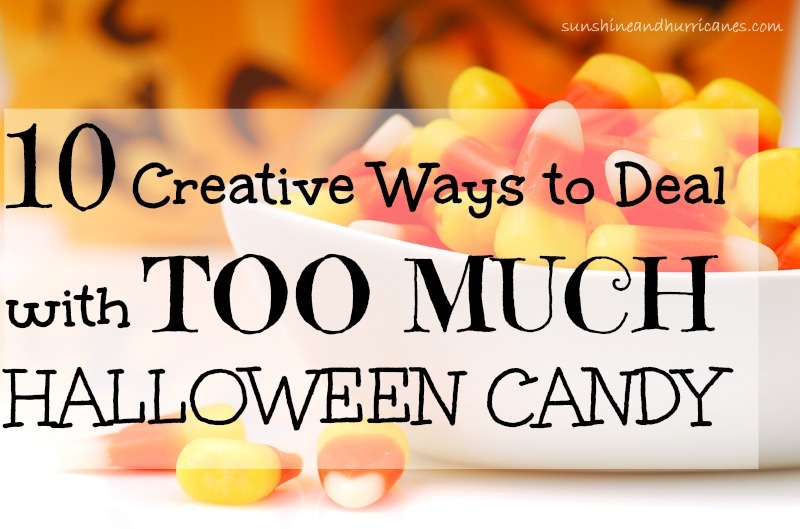 We have had so many struggles in the past couple of years about how much candy comes home, this list is so helpful! What great ideas for left-over candy. I never thought to donate it. Good idea! These are GREAT tips! Thank you so much! Really great ideas!! I had No Idea you could sell them to a dentist…that’s amazing. I usually just end up eating at it myself and then unfortunately most of it goes to waste. I am grateful to have a few more options this year…Thanks for sharing! I love this!! I did a similar post a few years ago. I’m actually putting together a post on baking with left over candies. I didn’t know that certain dentists would buy it-how cool. I just filled up mason jars with candy and thought the same thing. Thank God for mason jars, seriously! !